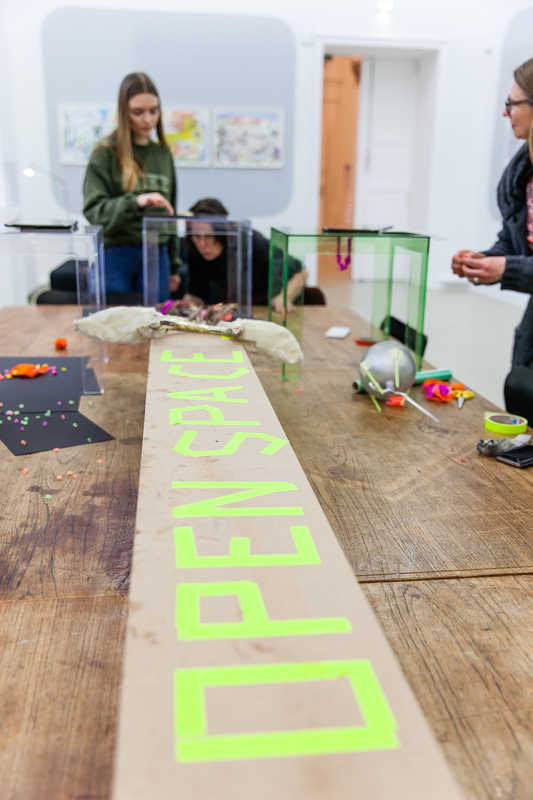 Visitors of the Kunstverein Hannover can test, experiment with and create things in the new “Open Space” starting in 2018. The innovative participatory workshop gives art lovers of all ages the opportunity to get creative each Friday afternoon from January onward. The format is cross-generational: young and old are called upon to become active in a variety of media. Thematically linked to the respective exhibition, different artistic techniques will be offered each week at the “Open Space”: The media range from drawing, to cyanotype exposure and painting robots, to digital image technologies. We construct vibrobots, make our own animated films and engage with wearable technologies. Participants needn’t bring anything along, and the format functions without advance reservation. The “Open Space” focuses on doing, not on skills. It doesn’t matter if the participants have experience in creative practices or not – everyone is welcome! In this way, a new common space for aesthetic experience emerges. Your own ideas are highly welcome, we are looking forward to your visit and participation! Each Friday from 3-6 p.m. Without registration; it is possible to join at any time. Charge for material depending on the program up to 3 € per person.